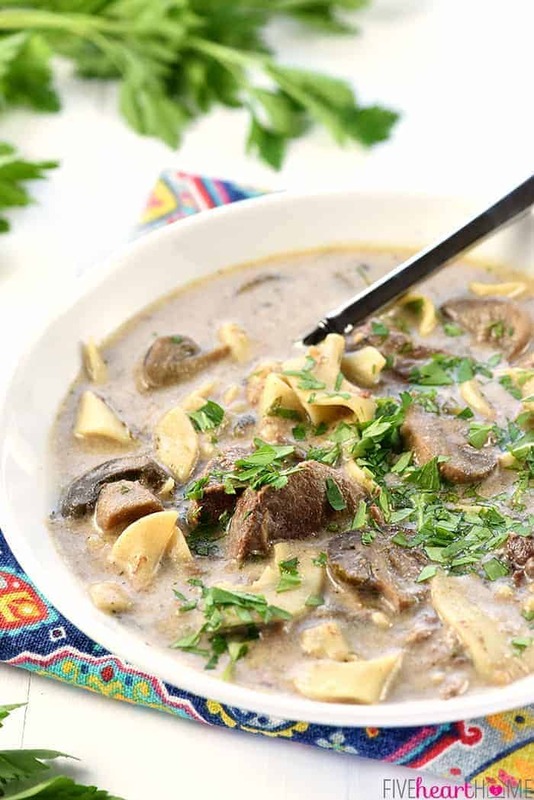 A classic comfort food recipe gets a crock pot soup makeover in this warm, hearty Slow Cooker Beef Stroganoff Soup, loaded with savory beef, mushrooms, and noodles! Y’all. How is Christmas only five days away?! I don’t know where the month went, but I do know that I need to get crackin’ on the rest of my holiday to-do list. 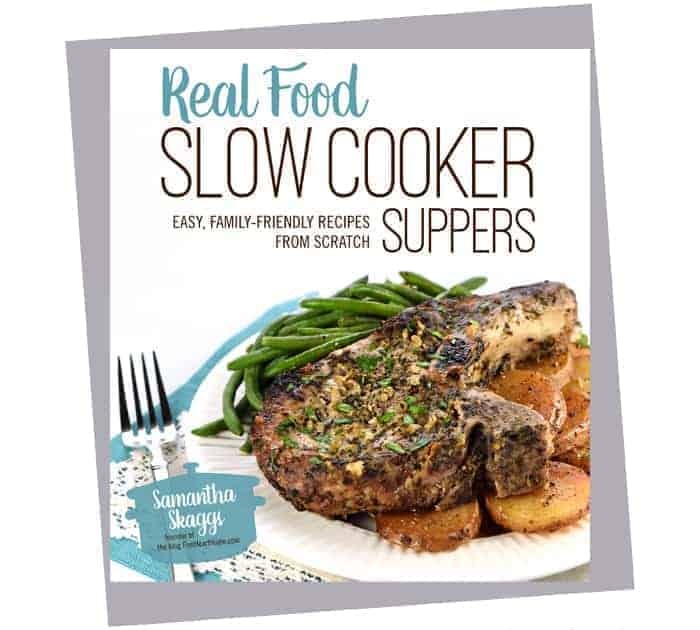 So that pretty much means no time for extraneous cooking…it’s a toss-it-in-the-crock-pot-and-dinner-is-done kind of week. 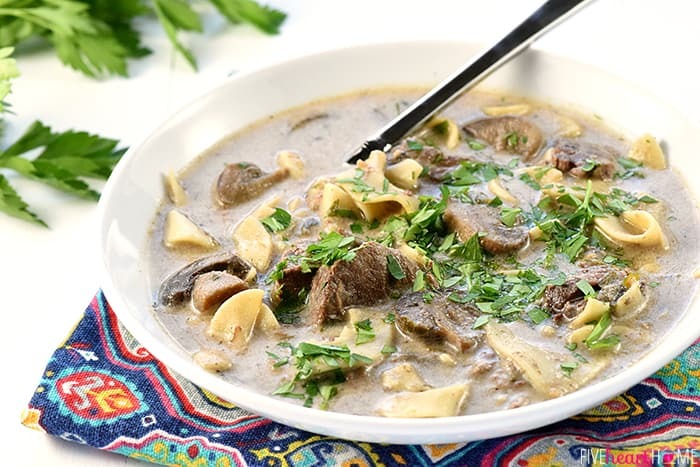 Lucky for us, this Slow Cooker Beef Stroganoff Soup meets all of the above requirements beautifully! I took my family’s favorite Slow Cooker Beef Stroganoff recipe (with NO icky gravy packets or condensed cans of ‘cream of X’) and turned it into a soup. Soup lovers rejoice! 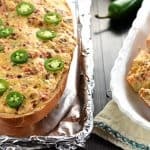 It’s so easy, friends, and soooo delicious. Simply load up your crock pot in the morning with chunks of beef (either beef stew meat or cubed chuck roast), mushrooms, and garlic. Pour in some beef broth and a bit of red wine for good measure, and flavor with Worcestershire, Dijon, herbs, and spices. Then let ‘er rip! After cooking all day — and shortly before you’re ready to eat — stir in some fresh parsley, sour cream, and a bag of egg noodles. Before you know it, dinner is served! And by dinner, I mean the heartiest, tastiest, warm-you-up-from-your-toes kind of soup. In full disclosure (and my regular readers already know this about me), I have this *thing* about onions. As in, I abhor them. 🙂 But I recognize that Beef Stroganoff usually includes onions along with all those yummy mushrooms, and I actually bought an onion with the intention of slicing half of it up to include in this recipe. But then — because I’m honestly just not in the habit of thinking about onions — I completely forgot to add them. Ooops. So pretend that onions are in there and add some to your soup if you like. 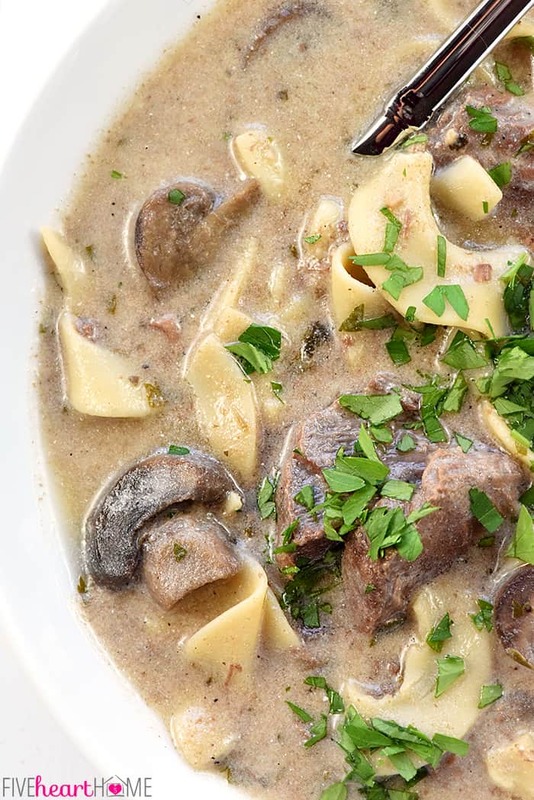 Just know that this batch of Slow Cooker Beef Stroganoff Soup didn’t technically have any (hallelujah, I say — ha). 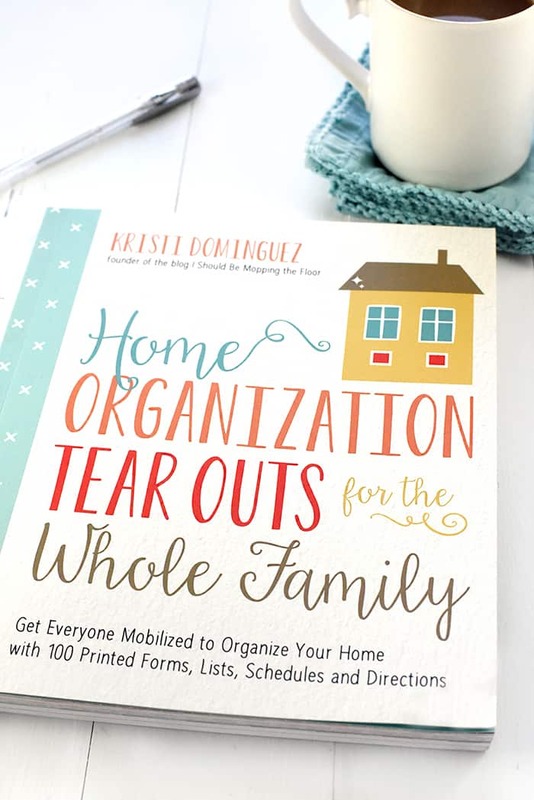 Home Organization Tear-Outs for the Whole Family is full of pages to help you organize your entire home, from tippy-top to basement bottom! The pages are tear-out, so you can use them straight out of the book…or you can make copies in order to re-use the pages over and over. 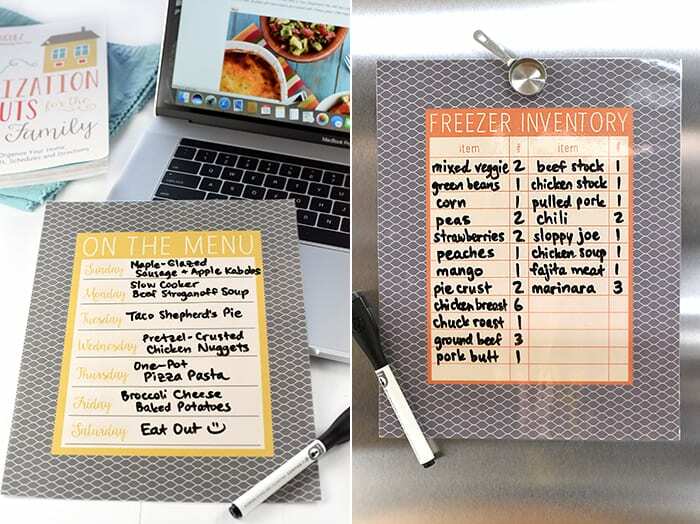 Or, in some cases, you can laminate or frame the pages for use with a dry erase marker to make updates on an ongoing basis! …and lots of fun and useful ways to use those pages! Now while I’m immediately drawn to anything cooking-related, I’m also extremely excited about all of the other topics in the book. How ’bout a sneak peek of the chapters? If you’re anything like me, this is the time of the year that you start thinking about how you want to be super organized and on top of things in the New Year. 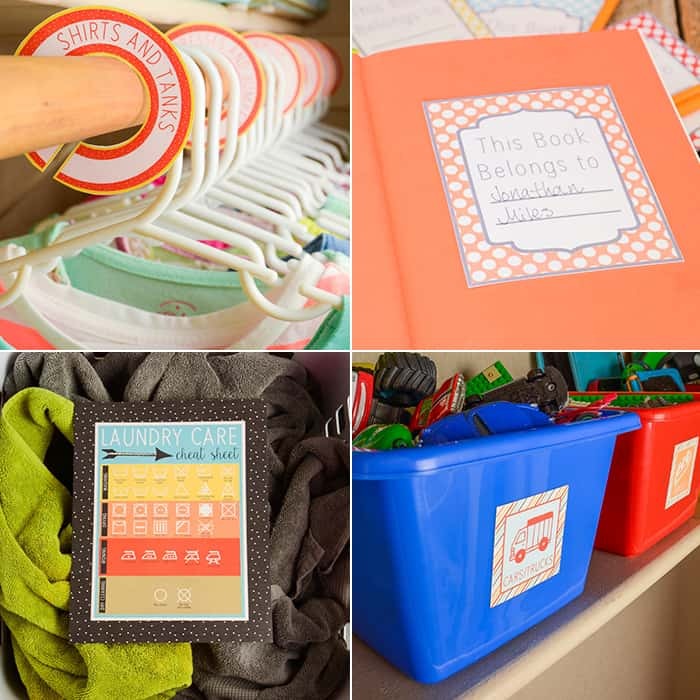 Well, Home Organization Tear-Outs for the Whole Family has got you covered! Kristi did such a thorough, fantastic job on this book and she didn’t miss a detail. It would make a great last-minute Christmas gift for, well, just about anyone on your Christmas list. And it would make a well-deserved gift to yourself as motivation to get 2017 started on the right foot! 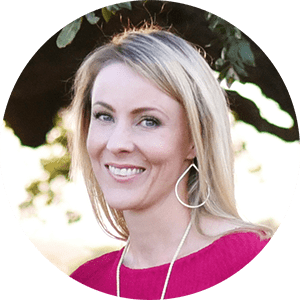 Read Kristi’s post about her new book <<< HERE! Find it on Amazon <<< HERE! Find it at Barnes & Noble <<< HERE! For your chance to WIN your very own copy of this awesome book, check out the Rafflecopter below…and complete as many entries as you wish for even better odds! 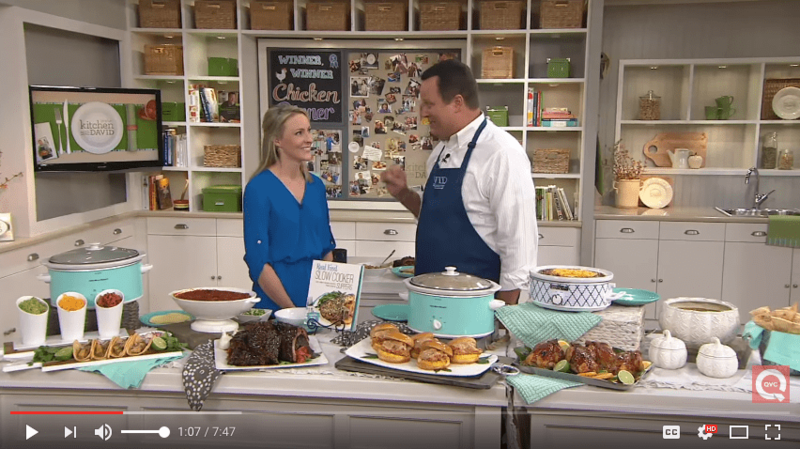 Kristi is so creative and talented, so I do hope you’ll hop over to explore her blog as well as her new book. Proud of you, friend! 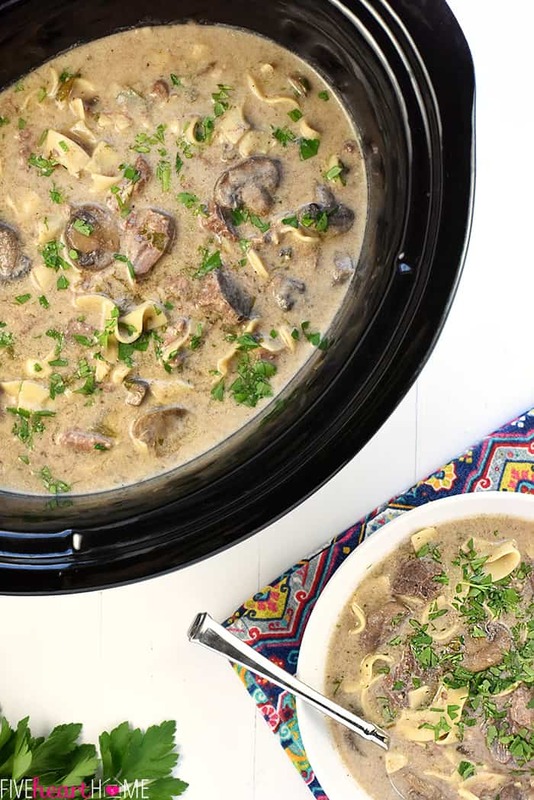 A classic comfort food recipe gets a soup lover's makeover in this warm, hearty Slow Cooker Beef Stroganoff Soup, loaded with savory beef, mushrooms, and noodles...and your crock pot does all of the work! Place the beef, mushrooms, onion (if using), and garlic in the bottom of a large (7- to 8-quart) slow cooker. Add the beef broth, red wine (if using), Worcestershire sauce, Dijon, garlic powder, salt, onion powder, dried parsley, dried thyme, bay leaves, and freshly ground black pepper (to taste); stir all ingredients to combine. 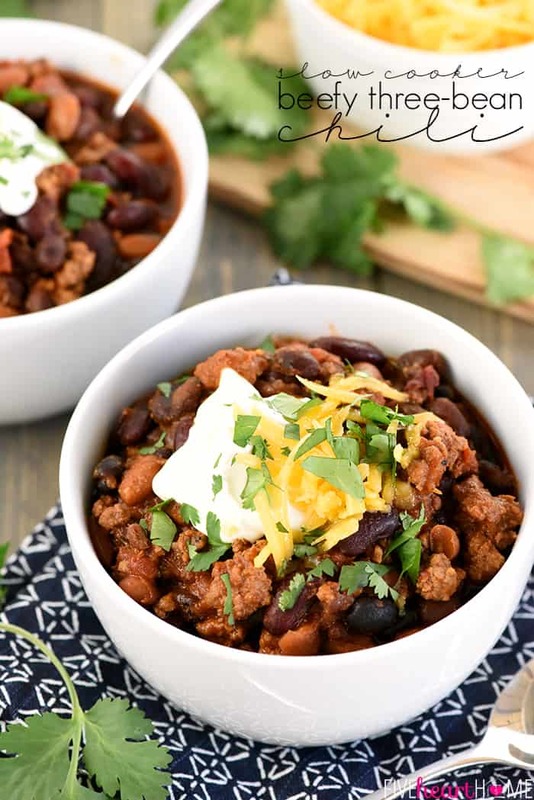 Place the lid on the slow cooker and cook for 8 to 10 hours on LOW (or 4 to 5 hours on HIGH). About 20 minutes before serving time, turn the slow cooker to HIGH. Transfer the sour cream to a large bowl and pour a ladle full of hot broth from the slow cooker into the sour cream. Whisk until smooth. Add another ladle of broth to the sour cream, whisk well, and repeat (adding broth and whisking) until the sour cream in the bowl is very thin, smooth, and liquid-y. Sprinkle the flour over the thinned sour cream and rapidly whisk until smooth and dissolved, adding more broth to the mixture if it starts to get thick or lumpy. Pour the sour cream mixture into the slow cooker and add the egg noodles and fresh parsley; stir well to combine. Cover and cook on HIGH for 15 minutes or until the noodles are al dente and the broth is slightly thickened. Remove the bay leaves, adjust the salt and pepper to taste, and serve hot, garnished with fresh parsely, if desired. 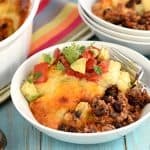 This recipe makes a good amount and fills up a large, oval slow cooker...so if you want to make it in a smaller slow cooker, you will want to cut the ingredients in half. 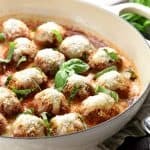 The amounts of beef and mushrooms in the ingredient list give a small range so that you can add more or less to your liking. Adding the full amounts makes for a hearty, chunky soup...adding the lesser amounts results in a higher ratio of broth. You may make this recipe with either trimmed and cubed chuck roast or beef stew meat. If you use chuck roast, you probably want to buy a larger roast than you need since a good amount of fat will be trimmed away. If you can find lean stew meat that's well-trimmed, it's a great time saver. But when stew meat is fatty and full of gristle, I prefer to start with a roast and trim/cube it myself. If you use regular (instead of low-sodium) beef broth, you'll probably want to reduce the amount of salt you add to the recipe. If you stir the sour cream straight into the hot soup, it's possible that it may get lumpy/curdle. Tempering it in a bowl with hot broth before adding it to the slow cooker allows it to be incorporated smoothly. To avoid further lumps, make sure that the flour is fully dissolved in the thinned sour cream before adding to the slow cooker. The flour slightly thickens the soup, but you may omit it, if you wish. 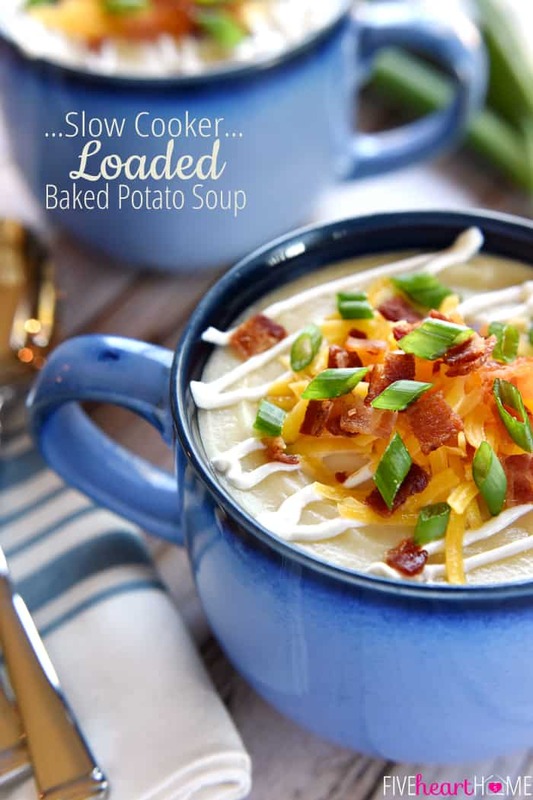 See all of our SOUP RECIPES <<< here! My home needs organizing! From the closets to the cabinets to the garage to the attic! It all takes time and energy…which we tend to be low on. This soup looks awesome! I need to get recipes organized! I have so many saved and they are not organized well at all. This soup really looks good. Beef Stroganoff is one of my favorite meals. This organization book is something I could really use in my life. I am so unorganized it is almost to the point of overwhelming. Thanks for the opportunity to win one. Hi Samantha! 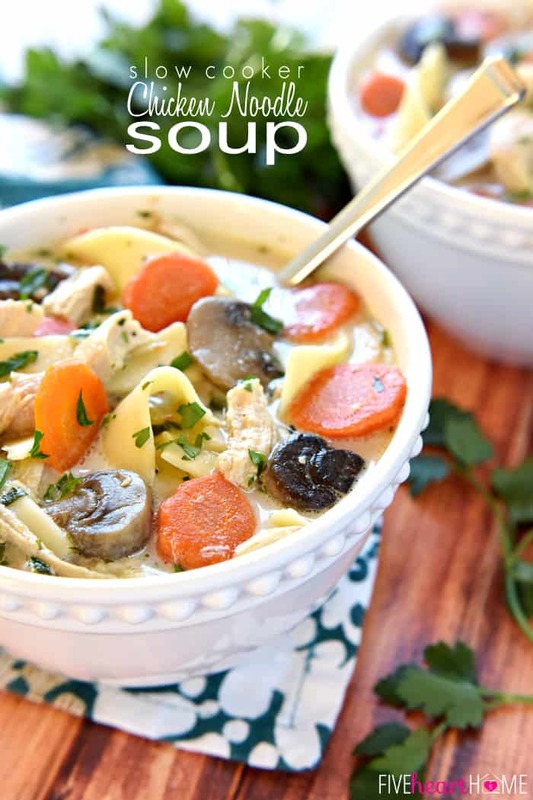 Love this soup idea I’m always looking for something different I seem to make the same soups all the time. The book looks awesome I need some organizational help in my life 🙂 Merry Christmas!!! The soup looks delicious! I could use some right now! (I forgot my lunch at home.) I love the idea in the book about a freezer inventory. I end up buying things I already have in the freezer because I can’t remember what’s in there. I definitely need help organizing! Soup looks great! Stroganoff is a favorite of mine also. I could really use some kitchen organizing! Every area of my life would definitely benefit from more organization! My office! I’m a full time student and blogger, so things can get pretty mixed up. I need to finally get organized this year. My bathroom and toiletry items really need to get organized. My pantry and kitchen cupboards!! My closets could use organization. My home is desperately in need of organization! I am still healing from some surgeries a few years ago, when my routines got derailed. Trying to step back into an orderly place. I am totally making that soup! Organized, yeah what is that, I have paths! My cabinets so need to be organized- it’s like my kitchen is about to explode but I just can’t seem to get it all done! OMG! my grocery list and my weekly chore list! I need to be more consistent about meal planning. 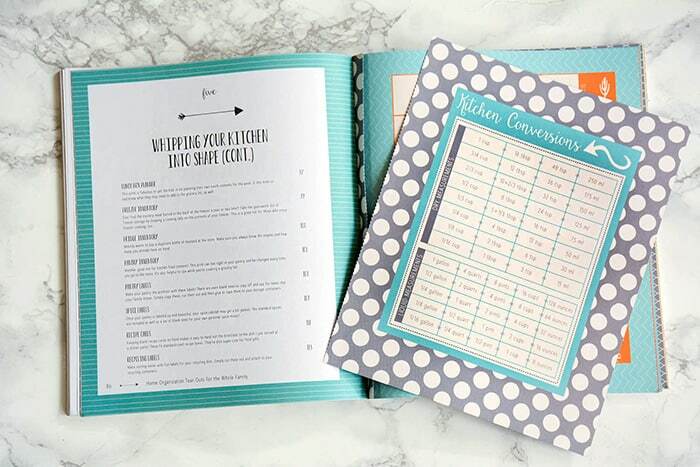 I could really use some organizing on the cooking/meal planning front! 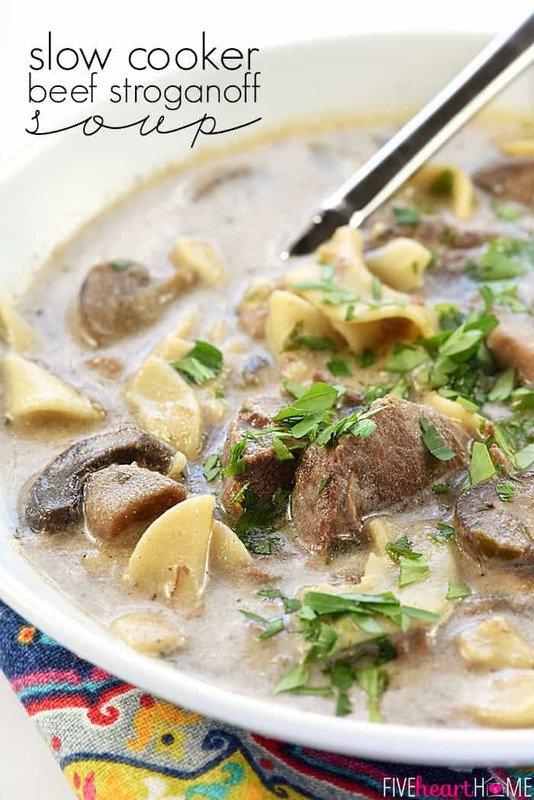 My husband loves stroganoff, I bet he would love this soup. All of my personal paperwork and bills needs the most organization after going through cancer for the second time this year. Organizing my closets is on my radar right now and I’m really looking forward to it! 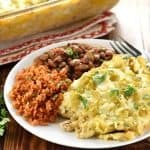 I am really trying to plan meals, so need to work on meal planning and grocery planning! I need to get my stuff at home more organized. My home needs organizing. We have stuff everywhere! I need to organize my living room, eliminate clutter from all my furniture, the chairs and tables, and place remote controls in a drawer. My kitchen very much needs organization, to cut down on meal prep time. 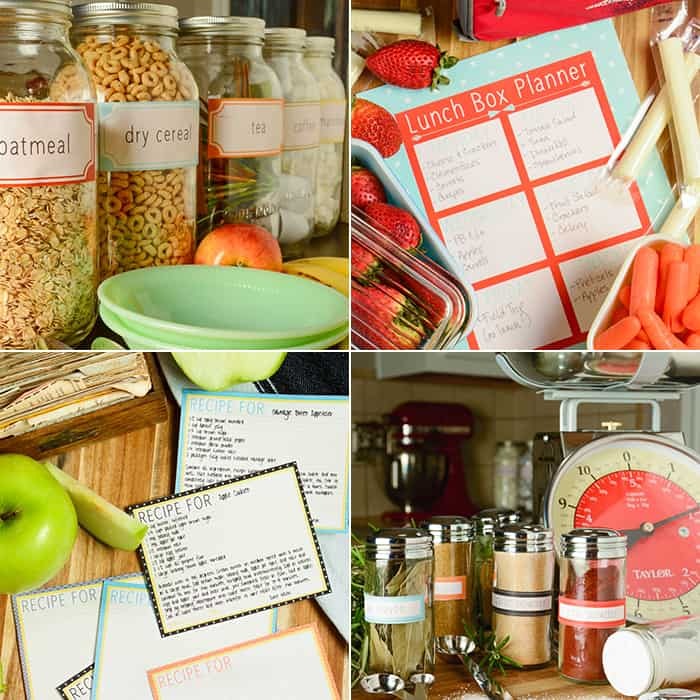 Also, I will try to keep the pantry and fridge organized to minimize food spoilage with bins, racks, trays and cabinets. My Laundry Room is a disorganized mess; so, compartments, bins and racks would help me in the laundry room, plus large hampers for dirty clothes. A better, organized bedroom closet would be nice, with shoes in organizers and then, my purses on orderly shelves and compartment containers on shelves, too. The kid’s room really has need of some organization, for sure, by simply stowing toys. in storage containers or a giant box that helos reduce clean-up time. I can definitely organize my Home Office, the messy desk, too. I also, need to develop a system to keep track of important documents such as bills, leases, and insurance contracts, books and magazines by using sorters, shelves, trays, bins and folders. 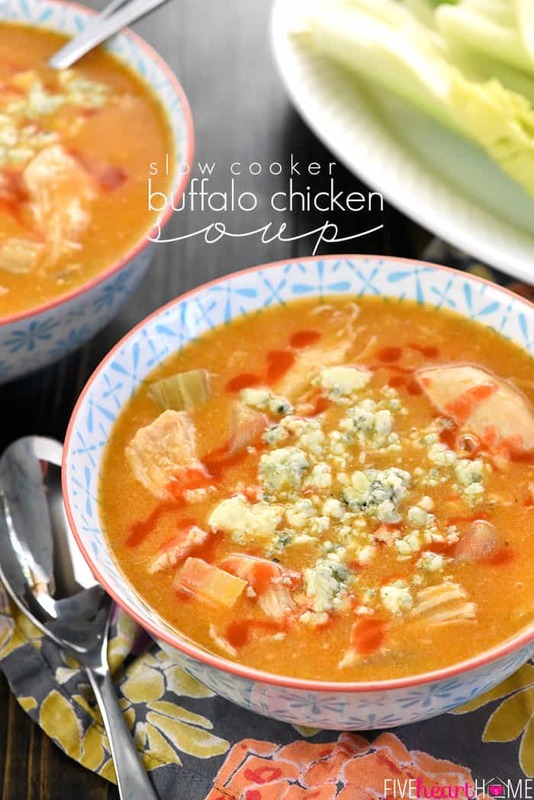 Would you possibly be willing to offer stovetop directions for this amazing soup recipe? Most appreciative.